Strategic Lawsuits Against Public Participation (“SLAPPs”) are when Big Resources (private or public sector) sue Little Resources (individuals, non-profit organizations) in order to silence them. If the person or organization being sued (often for defamation) can’t afford to fight the case, they are effectively prevented from speaking out on the subject that got them SLAPP’ed. The case may be weak or even ludicrous, but the merits don’t matter if you can’t afford to defend yourself in court. SLAPPs are civil lawsuits weaponized for censorship, and even cases that could not succeed on their merits can be strategically successful, since the litigation process is the punishment and not many people have the wherewithal to withstand a SLAPP. It is difficult to know how prevalent SLAPPs are in Canada, not least because many individuals and groups are effectively silenced with the mere threat of a suit, let alone having a case actually filed against them. However, even just looking at the cases that do become public, which may be only a very small portion of cases, it is evident that SLAPPs are a serious threat to freedom of expression and the public discourse needed for democratic debate. Community groups opposed to local development or industry activities, environmentalists and journalists are prominent among those targeted for SLAPPs. Very few jurisdictions in Canada have special laws designed to promote public participation by combating SLAPPs. There is a widely-held view that Ontario’s new anti-SLAPP legislation is a very good model. BC had very short-lived anti-SLAPP legislation but it was extremely weak and required that the party being sued demonstrate that those suing them were doing so for an improper purpose. Having “improper purpose” as the threshold matter creates an almost insurmountable barrier to accessing the protections of anti-SLAPP legislation. It is often impossible to prove what someone’s motives are or to demonstrate that they are operating in bad faith. When Ontario was considering anti-SLAPP legislation, it convened a “blue ribbon” panel of legal experts to advise on the legislation and that panel was very clear that requiring a demonstration of improper purpose is like requiring the judge to read someone’s mind. In most cases it can’t be done. The better approach is to follow the logic of human rights legislation and adjudicate not motive, but effect. In this framework, for example, if you are bringing a claim of discrimination against a party, it is not your job to prove that the party was intentionally trying to discriminate against you and it is no defense for the party to say that they didn’t intend to discriminate against you. What counts is effect, not motive. How this translates into Anti-SLAPP legislation is that the starting point for the inquiry is the question of the effect on public participation. The threshold question is simply whether the expression giving rise to the lawsuit against you is on a matter of public interest. The question of what constitutes a matter of public interest is not obscure in law. It shows up, for example, in access to information cases where discretionary non-disclosure is challenged. In such cases, the challenger, who is saying that it is in the public interest to disclose the information, generally points to media coverage to demonstrate that the public is interested. This should not be an onerous burden with respect to most SLAPPs. If the matter is squarely focused on the question of public interest and that is successfully demonstrated, then the burden shifts to the party that brought the underlying suit. That party would then need to demonstrate to the court 1) that their claim has substantial merit and 2) that there are substantial grounds to believe that the defendant has no valid defence. This operates as a screen. It is meant to filter SLAPPs at the front end of the process to minimize the strain, financial and otherwise, on the party being sued. But if this filter looks too much like a regular trial, many of the same problems persist. So, other components of effective anti-SLAPP legislation are procedural protections to make this filtering process short and snappy. These could include short deadlines for the plaintiff’s reply and filing of their materials, an expedited hearing, and automatic full suspension of the underlying action. Effective anti-SLAPP legislation should create economic disincentives for filing SLAPPs in the first place. There’s an array of options for doing this. There could be automatic full indemnity costs to the successful defendant, or an automatic award of compensatory damages for breach of expressive rights, and the possibility of a discretionary award of punitive damages where the judge is satisfied that the plaintiff was attempting to punish, silence or intimate the defendant. In effective anti-SLAPP legislation the question of motive is one for punitive damages, not, as ineffective legislation has it, as a threshold question. As well, an effective anti-SLAPP regime should look to reforming the plaintiff-friendly tort of defamation to protect certain public interest communications from liability. And finally, effective anti-SLAPP legislation needs dismissal with prejudice, which means that the plaintiff is prevented from amending their statement of claim unless the interests of justice require that the court allow for it. This means that dismissals under the legislation would ordinarily be final and the plaintiff can’t just re-launch their lawsuit with an amended claim when their first claim gets punted. When BC’s former (albeit, not very good) anti-SLAPP legislation was repealed, the government claimed that it was unneeded and that judges already had all the tools they required to dispose of cases that are frivolous or vexatious. This is simply not true. The claims that are being filed in these cases are not typed in all-CAPS. Claims will typically look sober and credible. They are, after all, legitimate causes of action. 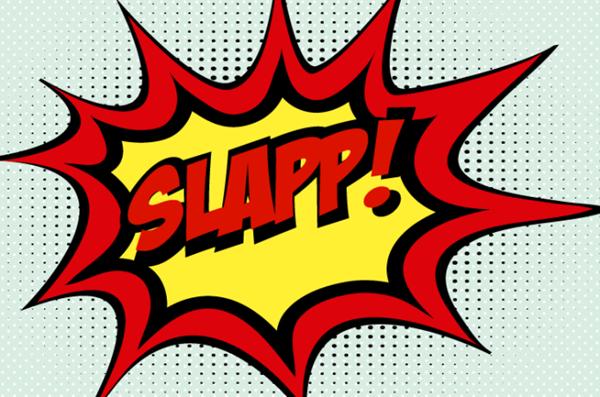 It is only the kinds of probing that anti-SLAPP legislation provides that can identify SLAPPs. There is not only a clear need for the filter of anti-SLAPP legislation to protect public participation, there is an urgent need. And happily, no one has to start from scratch. Thanks to the thinking that went into the Ontario legislation and the trailblazing work in the field from scholars that include Chris Tollefson from the University of Victoria, we have a blueprint for what is needed. It is time for all Canadian jurisdictions to get on board. Want to stay up to date on our work pushing for anti-SLAPP legislation? Sign up below.